The human ear, is an organ of hearing and equilibrium that detects and analyzes noises by transduction (or the conversion of sound waves into electrochemical impulses) and maintains the sense of balance (equilibrium). The human ear, like that of other mammals, contains sense organs that serve two quite different functions: that of hearing and that of postural equilibrium and coordination of head and eye movements. Anatomically the ear has three distinguishable parts: the outer, middle, and inner ear. The outer ear consists of an outer, funnel-like structure called the auricle(or pinna) and an S-shaped tube, the external auditory meatus. 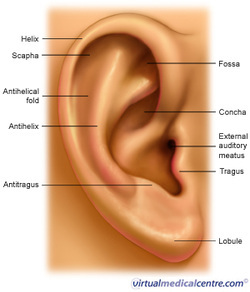 The shapes of the outer ear (the auricle) and the external auditory canal can help amplify and direct the sound. 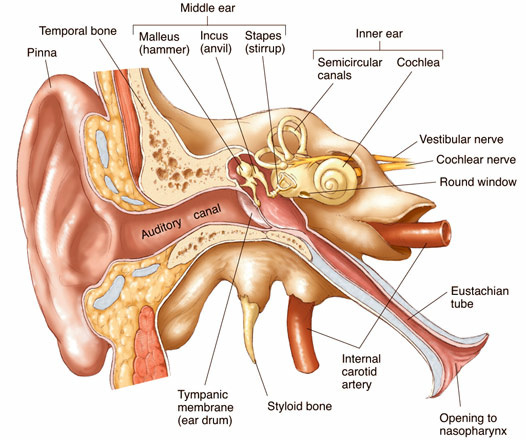 Sound waves entering the external auditory canal eventually hit the tympanic membrane, or eardrum (tympanum = drum), the boundary between the outer and middle ears. The eardrum marks the border between the outer ear and middle ear. The eardrum serves as a transmitter of sound by vibrating in response to sounds traveling down the external auditory canal, and beginning sound conduction in the middle ear. The middle ear is an air-filled chamber on the other side of the tympanic membrane and inside the cranial bone. A tube, called eustachian tube, emerges from the middle ear and opens into the nasopharynx. The middle cavity contains three small pieces of bone (the auditory ossicles)- malleus (hammer), incus (anvil) and stapes (stirrup). The handle of malleus is attached to the central part of tympanum called Umbo. Malleus is attached to the incus by ligaments and incus is attached to stapes. The foot plate of stapes is placed on the oval window of the cochlea. They transmits the sound vibrations of tympanum to the fluid in the inner ear. Transmits sound vibrations to the inner ear. Dampens the sound vibrations of the inner ear. 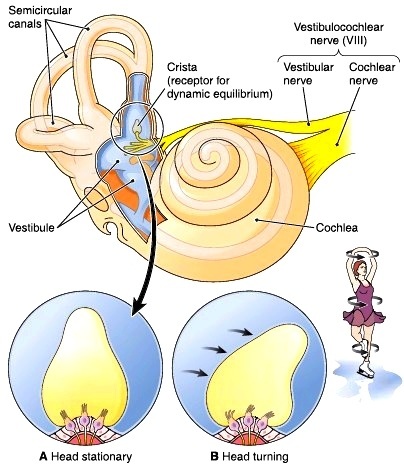 The vestibular apparatus and cochlea. The internal ear is called labyrinth due to its complex shape. The bony structure is called bony labyrinth, it encloses a membranous sac called the membranous labyrinth. The fluid present between the bony labyrinth and the membranous labyrinth is called perilymph and the fluid in the membranous labyrinth is called endolymph. The vestibular apparatus consists of three semicircular canals and two sacs- utricle and saccule. The semi circular canals open into utricle. Each canal is dilated at the beginning this is called as ampula. The ampulla has sensory area cristae. 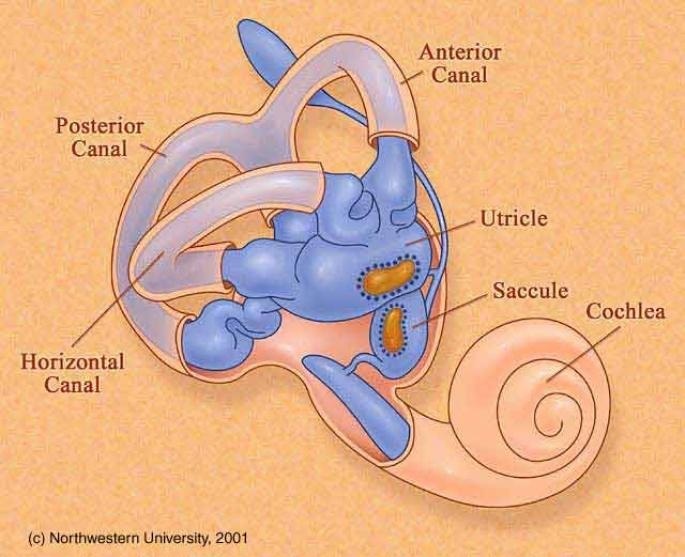 The utricle communicates with the saccule and the saccule in turn communicates with the cochlear duct. The utricle has sensory area called as macula. Macula uticuli in the utricle and macula sacculi in the saccule. The fluid has particles of calcium carbonate called otoliths. The cochlea is the site of the sense organs for hearing. The cochlea consists of a bony, snail-like shell that contains three separate fluid-filled ducts or canals. The upper canal, the scala vestibuli, begins at the oval window, while the lower canal, the scala tympani, begins at the round window. Between the two canals lies the third canal, the scala media. The scala media is separated from the scala vestibuli by Reissner's membrane and from the scala tympani by the basilar membrane. The scala media contains the organ of Corti. The organ of Corti lies along the entire length of the basilar membrane. The organ contains hair cells and is the site of the conversion of sound waves into nerve impulses (phonoreceptors), which are sent to the brain, for auditory interpretation as the auditory nerve. The receptors for dynamic equilibrium function when the body is spinning or moving in different directions. The receptors, called cristae, are located at the bases of the semicircular canals. Hearing is the process by which the ear transforms sound vibrations in the external environment into nerve impulses that are conveyed to the brain, where they are interpreted as sounds. The ear pinna directs sound waves from the external environment and directs them to the tympanic membrane. The ear drum vibrates. Ear ossicle vibrate and and pass the vibrations to the oval window. Endolymph vibrates in the scala media. Basilar membrane vibrates. Tectorial membrane vibrates and stimulates sensory cells of organ of corti. Nerve impulse is created in auditory nerve which conducts message to the hearing center of the brain.